Fight breaks out during anti-violence rally in Newark on December 30, 2015. The Newark Police Department is investigating a scuffle that broke out Wednesday afternoon between two groups of anti-violence activists who gathered for a rally to urge Mayor Ras Baraka to address the city's alarming level of violence. 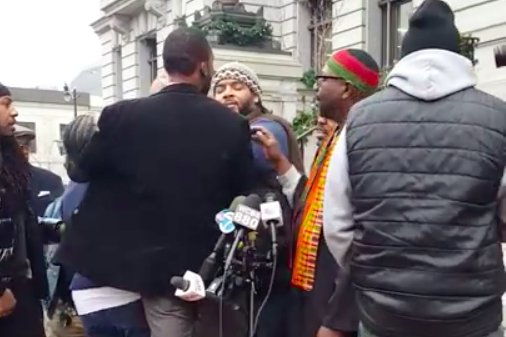 The altercation occurred during a press conference held at City Hall around noon, organized by activist Salaam Ismial of the New Jersey Study Commission on Violence, according to NJ.com. Also in attendance were supporters of Newark anti-violence activist Abdul Muhammad. In the midst of the press conference, as Abdul Muhammad spoke about a recent rash of shootings, supporters of Mayor Baraka began to heckle the activists, led by Donna Jackson and Tyrone Barnes. In the video below, Muhammad is seen delivering an impassioned speech on violence in Newark. At the very end, the confrontation begins to turn physical, though the video does not include a moment when Barnes reportedly grabbed Muhammad by the neck and pulled him to the ground. There were no serious injuries and the entire scuffle lasted a matter of minutes, but Ismail said following the event that he hoped the scene would not detract from the group's core message that stopping the surge violence will require political willpower. In a statement, Newark spokeswoman Marjorie Harris distanced the city from the rally, adding it should have taken place in Ismail's hometown of Elizabeth. Mayor Baraka provided a statement criticizing Muhammad, a former city employee, for the unruly event. It was...disheartening to learn that a former Newark municipal employee, Mr. Abdul Muhammad, was the instigator in a confrontation with another well-known Newark community activist and was allegedly pivotal in the ensuing melee...The actions of this Elizabeth-based group discredit the efforts of so many who are committed to speaking out against violence in the neighborhoods and streets of both cities." Newark leaders are currently creating a "public safety" department to be led by Essex County Prosecutor's Office Chief of Detectives Anthony Ambrose. Once implemented, the department will monitor and help guide the work of Newark's police, fire and emergency services.